So this is what it has been all about - or half of it, at least. 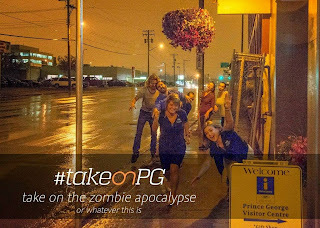 In May a film crew came to Prince George and taped this and The Efficient Weaver, due out in about a month. It was great fun to have Anita and Garrett here (this one was taped in the guild room, The Efficient Weaver in my studio). It was also a lot of work but well worth it. For all those people who have been asking me for years when I was going to do a DVD, here 'tis. Well, one more thing to cross off my bucket list??? Yes I am. Loving this blue warp. 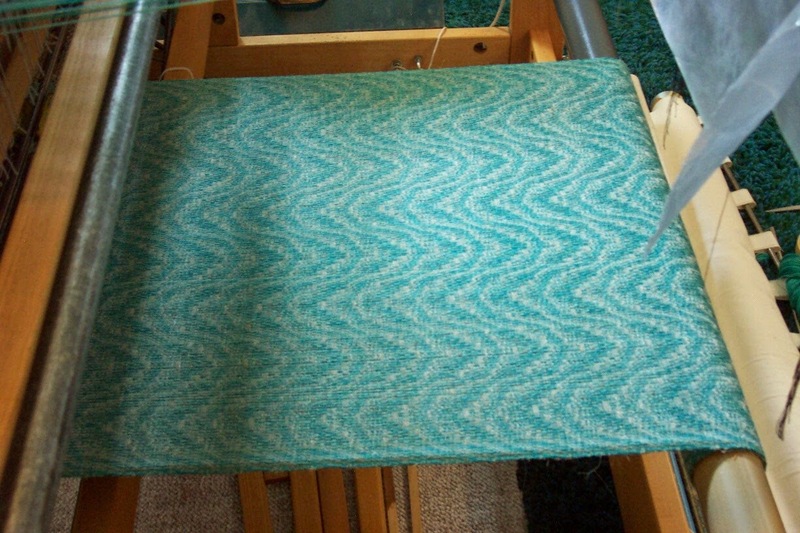 It doesn't look like much at a distance though, so I'll get a better photo once it comes round to the back of the loom. As usual I'm weaving it 'upside down' in order to lift the fewest shafts. This puts the majority of the linen on one face of the cloth, the cotton on the other. Yesterday I was very, um, distracted. I kept changing my mind about what I would work on 'next' instead of focusing on what I am working on 'now'. 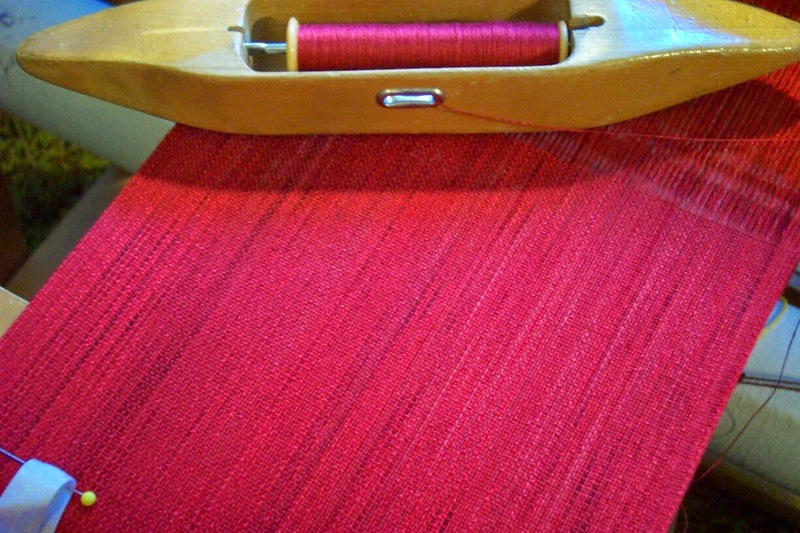 And that is this lovely, very red, painted scarf warp. I am very affected by colours and today this red is really appealing. 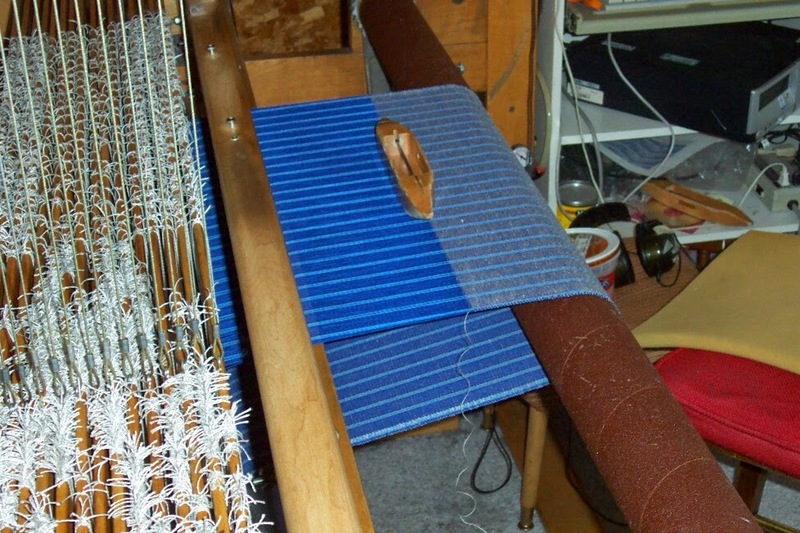 But I also have that blue towel warp to thread on the AVL, so I will be alternating between the two looms. In the meantime I got Doug to drag four boxes of yarn to the studio from the annex and on Friday I'll ask a friend to help me unload, sort and put it 'away'. Some of it is skeins that need to be put onto cones so they will be easier to work with, plus easier to see on cones on the shelf rather than a jumble of skeins. And then I can start designing another line of scarves. I am on a mission to use up as much of my stash as possible and that objective is coming along quite nicely as I am working on the principle of 'slow and steady as she goes'. Since I don't know when the surgery will happen I'm trying to get as much as possible done now. The good news, however, is that several friends who already belong to the Zipper Club have said that recovery didn't take very long at all. So I'm staying hopeful and positive that once the surgery is done I will be better than ever. And a big thank you to those of you who have shared your experience. It really helps. 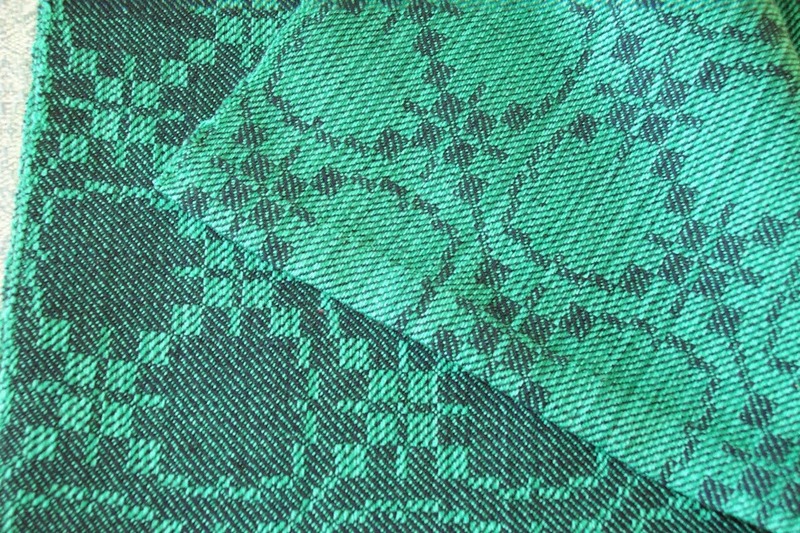 Technological advances over the last few decades have rekindled our interest in the innovative fibres of the mid-twentieth century. Industry can now successfully manipulate a fibre’s surface texture, longitudinal shape, crimp, staple length, tensile strength and cross-sectional shape. But has it truly been able to imitate the drape and lustre of silk as envisioned by English naturalist Sir Robert Hooke, English chemist Joseph Swan, Swiss chemist Audemars or Louis Pasteur’s student Count Hiliaire de Chardonnet? You be the judge; as we explore fibres with exotic names such as: Bamboo Silk, Corn Silk, SeaCell, Silk Latte, Soy Silk, etc. With this, albeit brief, hand-on study you will come to appreciate and understand these ‘new’ fibres’ strengths, their weaknesses, their positive contributions and their negative impacts/drawbacks. This in turn puts us in a better position to make our fibre choices in an intelligent and mindful manner. Materials fee is $50, class is $150 for a total of $200. We are asking for $50 deposit to hold a spot. Guild members can send deposit to the treasurer, Birthe Miller. If you aren’t a member and would like to become one, email me laura at laurafry dot com and I will put you in touch with our membership person for details on cost. Even though I'm not really a spinner, I'm looking forward to this workshop in order to find out a lot more about the new fibres available to spinners (and weavers). People from out of town are welcome to participate - there are 3 spots left - and we will try to find billets with local guild members for anyone who wants one. 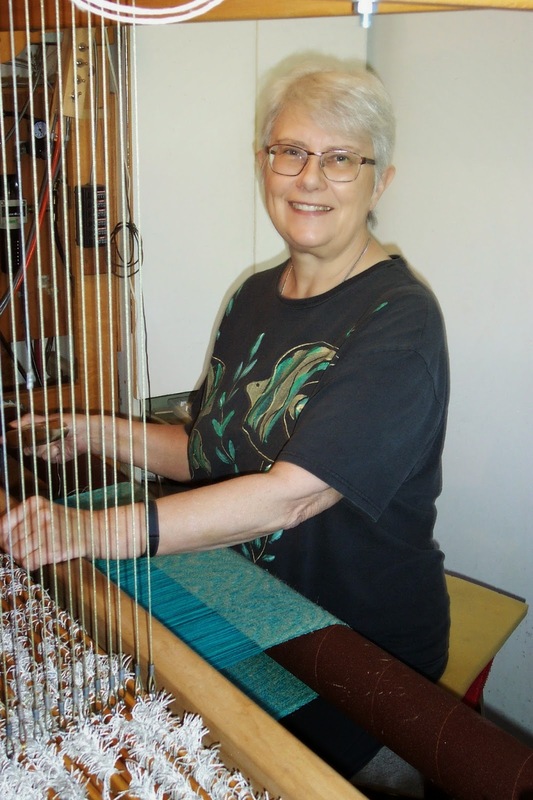 Kim has gotten very busy with her teaching lately and will be at Knit City in Vancouver in October. We are very pleased that she was able to fit us into her schedule. A Good Yarn (the series) came about because it was apparent that too few people really knew or understood the essential characteristics of the various fibres that we work with. So each publication in the series dealt with the fibre characteristics and how those might be affected by preparation for and spinning. Other information such as the difference between 2/8 and 8/2 cotton was given for Cotton, various yarn counts for Rayon, burn tests and other interesting things were were included. 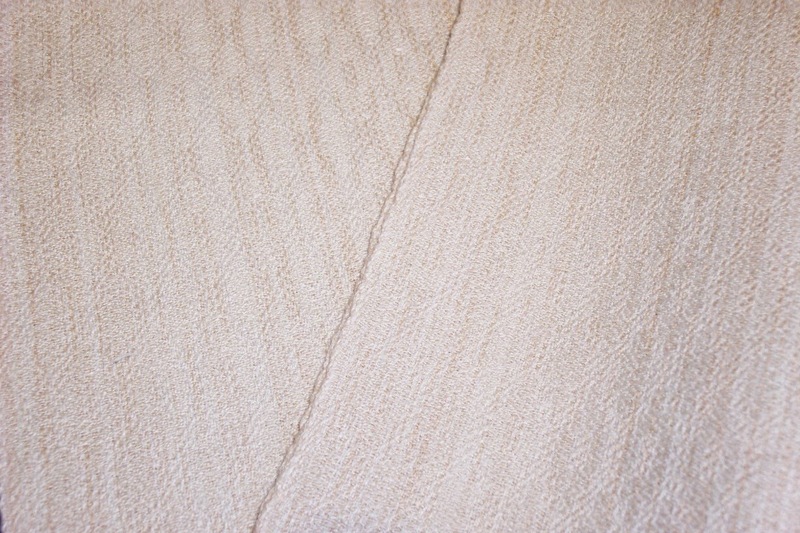 Then I wove samples with various types of yarn and included before and after wet finishing so that the change in appearance and feel could be clearly illustrated. The copies were signed and numbered. 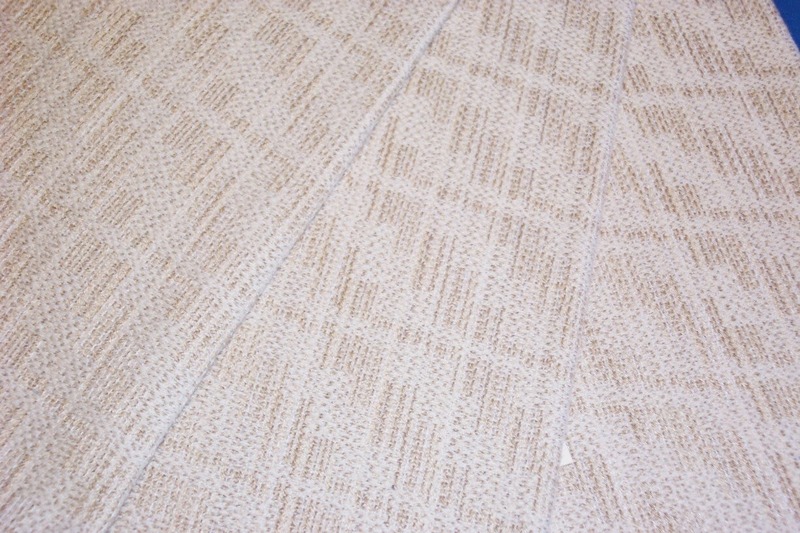 Rayon is the only title left as Cotton and Linen/Hemp are now sold out. Will I digitize these publications? Possibly. With my teaching schedule curtailed, I might possibly have the time to tackle this in the new year. It depends on whether or not there is sufficient market for it? 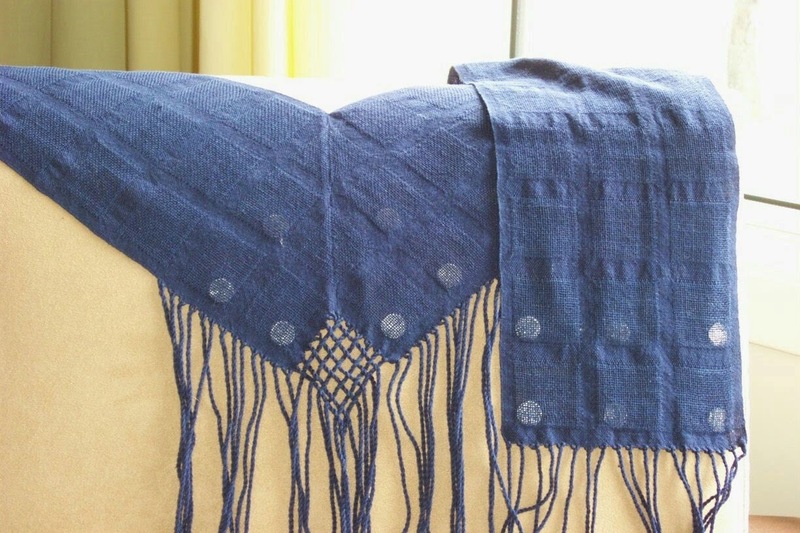 Weave a V was written by Kerstin Fro:berg and details how to create a V shaped shawl using double weave. Instructions are for both rising and sinking shed looms. 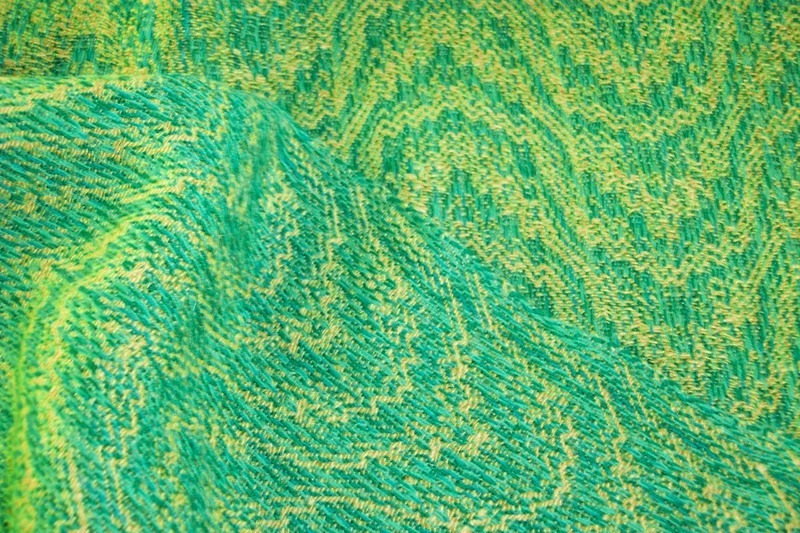 Weave a V is $20 ($5 shipping) and A Good Yarn: Rayon is $40. Buy both (or any two items, including towels - email me for pictures or read previous posts) and get free shipping. This evening I finished weaving the cream warp, cut it off the loom and readied it for the next step in the process - cutting the towels apart and serging the ends. 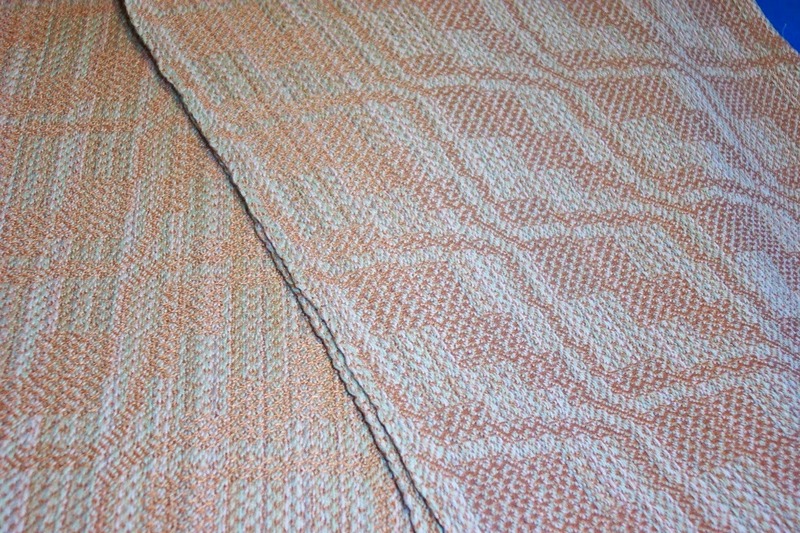 I ran out of weft right about the time I ran out of warp - there was a half bobbin of tow linen left and a yard of warp - too little to weave another towel. 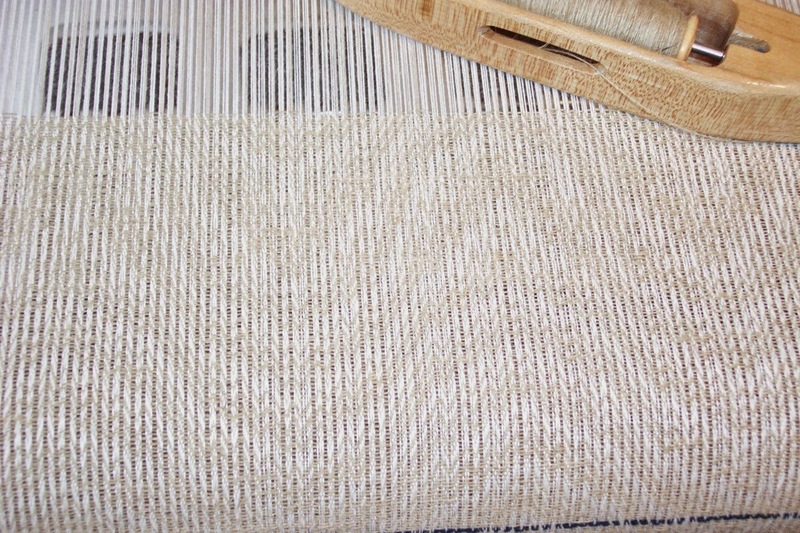 Yesterday and today I have been working on the next warp. 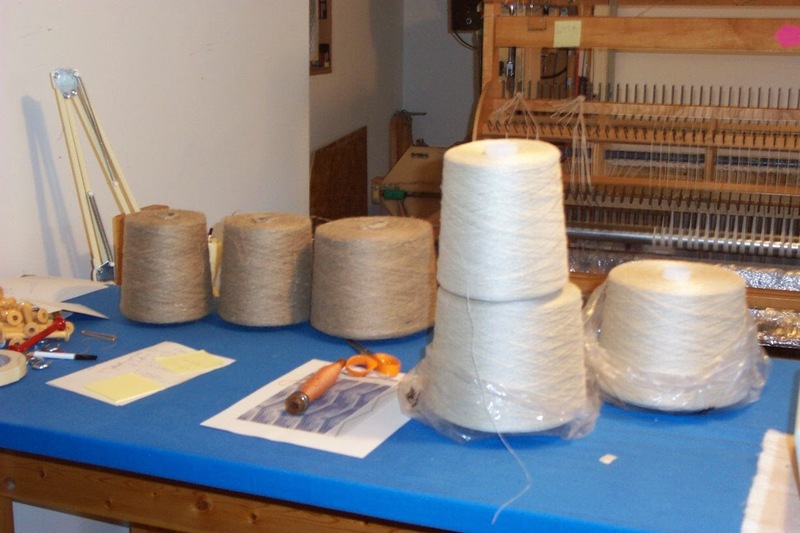 The tubes are pulled and set onto the spool rack, threading worked out, two options for treadling ready. The yarn on the right used to be fairly easy to buy - I think the company (Linos La Union) has gone out of business as it's been many years since I've seen this particular yarn available. I don't know the size nor the yards per pound. 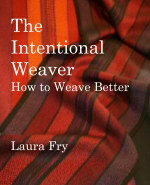 All I know is that it is a lovely yarn and weaves up beautifully. Lynn had already given me several cones of this yarn before she died. Imagine my surprise when we found three more cones. And they are hefty cones. The two larger ones weigh in at 3 pounds 13 ounces each, the smaller one is 2 pounds 4 ounces. It appears to be about half the thickness of the singles 12 tow linen (yes I found more cones - much darker brown than the 11 pounds I just finished!) so I'm thinking it must be around 6000 to 7200 yards per pound. 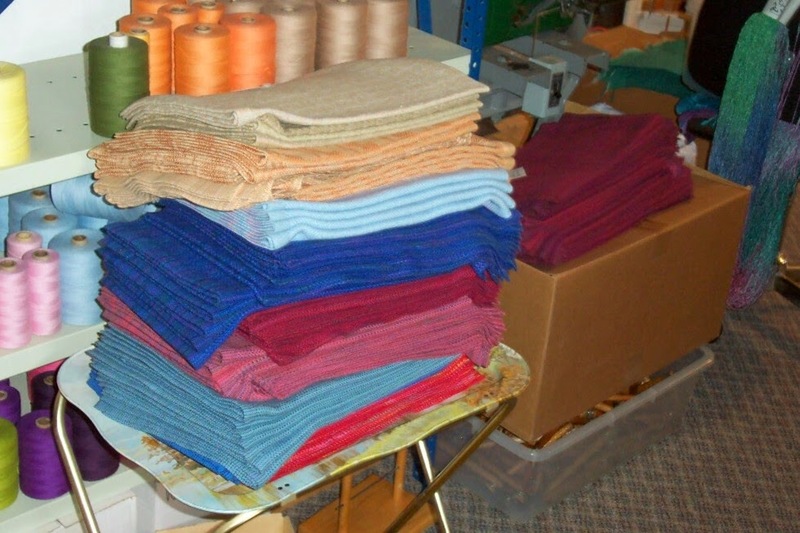 With nearly 10 pounds of this fine singles, I am going to be weaving tea towels for a very long time. In fact, I'm starting to run out of the 2/16 cotton and will be forced to buy more next month. In the meantime I have enough to wind this warp and a few more but I'd also like to have a broader range of colours for people to choose from than what I have available here and now. Need to start dreaming some new fibre dreams. Brassard will soon be open for business again after their summer vacation. Some of the towels available on the July Special of buy two items get free shipping - I can send photos of what is available...prices range from $24 to $36 each. A Good Yarn: Cotton is now sold out (unless I find another copy hidden away, but I think I've got them all unpacked now). A Good Yarn: Rayon - 21 left. Weave a V - lots. When you are self-employed, every day is a potential work day. It is also potentially a day 'off'. And so it was yesterday. I've been pushing myself steadily since getting home from Vancouver and it was time to set the studio aside for a bit. The morning was taken up with doing the 'mom' taxi thing, knitting drop in and then an email from a friend asking if I wanted to visit. We arranged to meet at Tim Horton's (coffee chain here in Canada) and we talked the whole afternoon. By the time I got home it was dinner time and after we ate, instead of heading down to the loom, I worked on the mountain of hemming. My mother used to ask the rhetorical question "How did you get to be so stubborn?!" It took all my will power to not respond "Have you looked in the mirror?" During my mother's long life (and my father's all too short one) Life Happened on a regular basis. Time after time she weathered the storm and, now 87 soon to be 88, she picked up the pieces of her life and carried on. I suppose I inherited this wide stubborn streak from her. Or maybe there is just a level of pragmatism that allows me to see that everyone, everywhere, has Life Happen to them on a regular basis. None of us gets out of here without having calamity happen to them at some point along their journey. Sometimes frequently. I suppose that what I learned from my mother was that we have two choices. That's it. Just the two. We let the wave crash over us, pick ourselves up and carry on. Or we sink into the quagmire that has been left behind. When my brother died and my health issues were diagnosed I had a touch of survivor guilt. Why was my younger brother taken away from this life and I left behind? He who had given so much to so many, worked so hard to make his dreams come true, endeared himself to so many and, ultimately, would be so missed by literally hundreds of people? The church was overflowing at his funeral - a church which easily holds 250 - and not everyone who held him dear was able to attend. Why was I left behind? Why, indeed, am I still here? I have no answer to that question. All I know is that I still am. Therefore my time is not yet over. The only thing I can do is to live my life as best I am able. To wait til the waves wash over me then pick up the pieces and carry on. Remember - buy any two items and receive free shipping - until July 31, 2014. 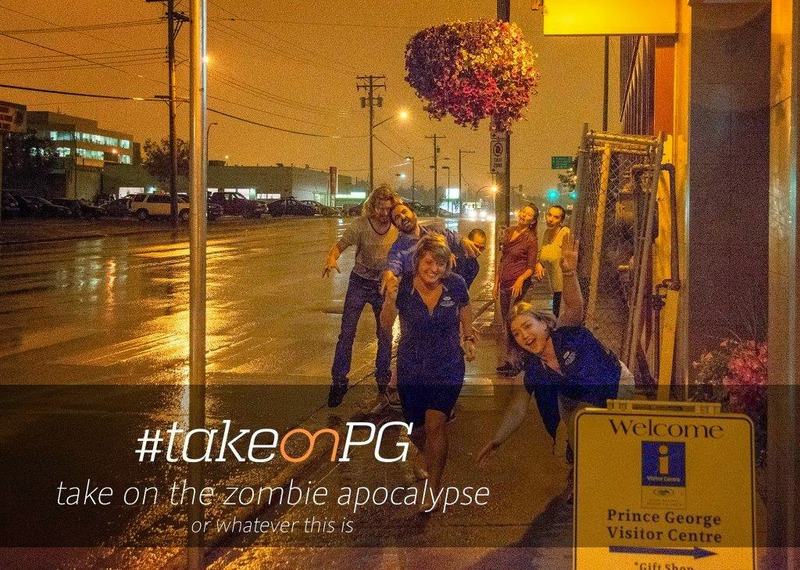 If you have been following along on my adventures, you might remember this post. Yes, this is all that is left as of today. 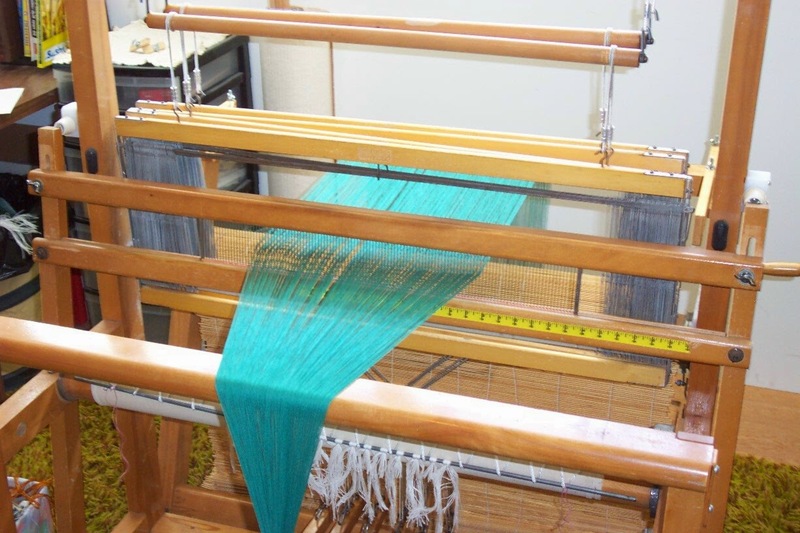 I've already wound the warp for the cream and will wind two more shorter warps for the rose and green because there is less than one pound of each of those and it was taking about l pound 3 ounces of yarn for the weft on my standard length mat warp. In addition to this progress making place mats, I've also woven 32 tea towels, using up 6+ pounds of the singles 10 tow linen. With 4 and a bit pounds left, I've beamed a 30 yard cream warp in hopes of seeing the end of that particular yarn very shortly, too. One of the things cancelling my teaching contracts has done is open up the next year to not having to think about anyone else - no hand outs, no re-tooling class samples, no ironing out travel details. It is kind of refreshing to be a little bit selfish, only having to think about what I want to do. Getting stuck into my stash and using it up as quickly as I can. In the meantime I'm in limbo waiting to hear what happens next - and finding out a possible time line for when it's going to happen. So I'm trying to stay in the here and now, focus on weaving and picking my way through as much of my stash as I possibly can. This morning dawned - if I can use the term loosely - with a dark nasty grey/yellow/orange light from the cloud cover and thick smoke from the wildfires burning all around us. The tourist bureau came up with this poster, which I thought was rather clever and took the surreal nature of the light and made fun of it. We are fortunate in that none of the big fires are really close to us but we are surrounded and no matter which way the wind blows we seem to be in the smoke plume. Thankfully we had a day of respite yesterday, which made today even more depressing. If this continues much longer I may have to run away to the coast to get away from it. In the meantime I'm trying to stay on track with the weaving, stash reduction, inventory build, etc. Both looms have new warps and I'm going to start weaving on the small loom today. The AVL will take about 3-4 hours (spread out over a day or two) to thread and then I should be able to use up the last of the tow linen in the singles 10 size. Of course there are boxes of more fine linen still at the annex. Unfortunately I can't get to the yarn because the other night one of the shelving units attached to the wall came loose (possibly due to the earthquake in the Yukon?) dumping all the stuff stored on the shelves onto the pile of boxes in the middle of the floor. Doug will have to move everything out to the loading dock, replace the unit that came down, repair the one next to it that was partially torn down, then move everything back again. In an ideal or perfect world, none of us would get distracted or sloppy. But that isn't how life is. We get tired, stressed, distracted and sloppy, sometimes all at once. And so I lost the cross in this warp due to one or all of the above - mostly because I got sloppy with how I secured the lease sticks. However, losing the cross isn't the end of the world or even the warp. 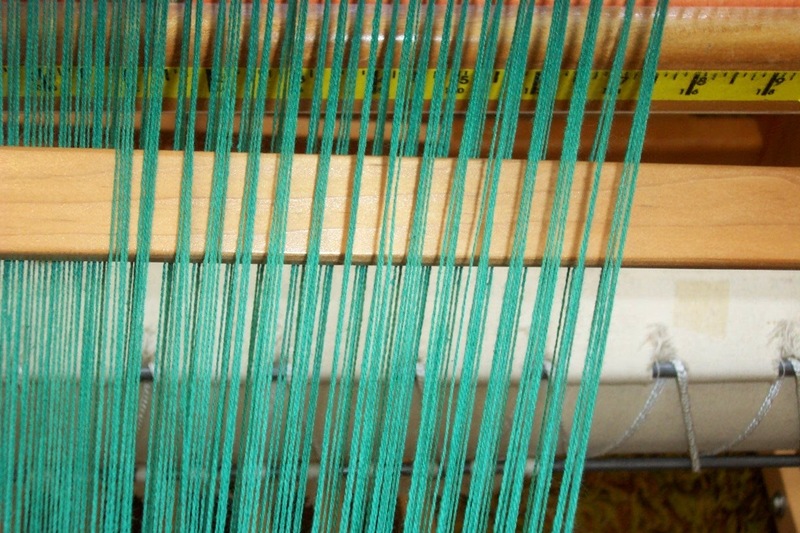 Since I use the reed to spread the warp, the threads stayed in their order in groups of four so it was an easy matter - like about 2 minutes - to pick the cross up again so that I could transfer it to the back of the heddles for threading. July 15 about 6:30 pm taken with my phone. The reddish ball is reflection, the sun is the smaller yellowish ball. We should be having clear blue skies, not this murk. 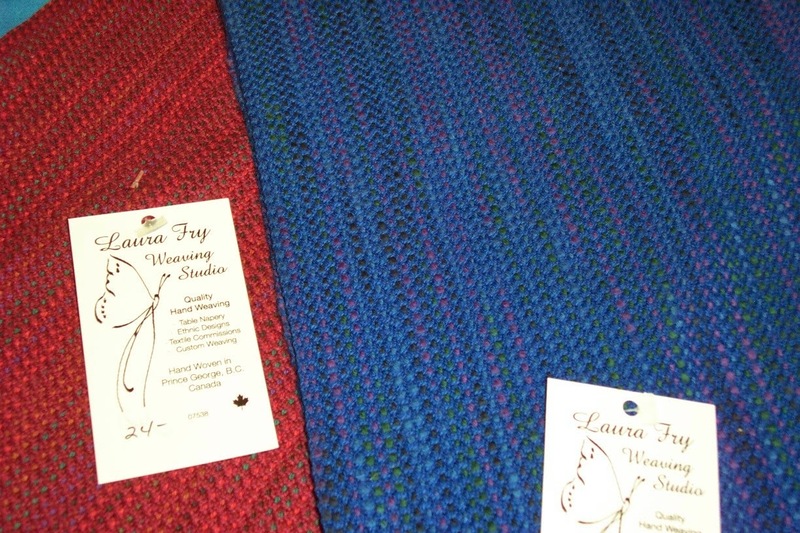 A Good Yarn: Cotton (2 copies), A Good Yarn: Rayon (way too many copies left - 40?) 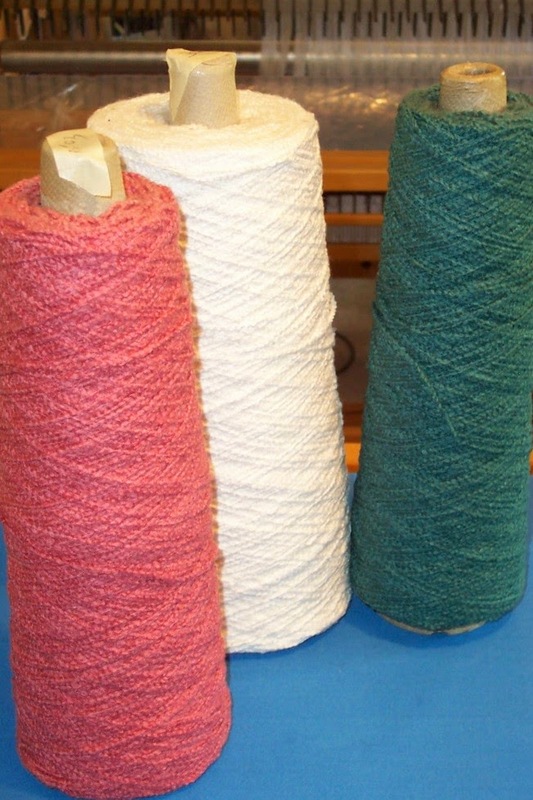 are sample packets with explanations of the fibre characteristics of each yarn. 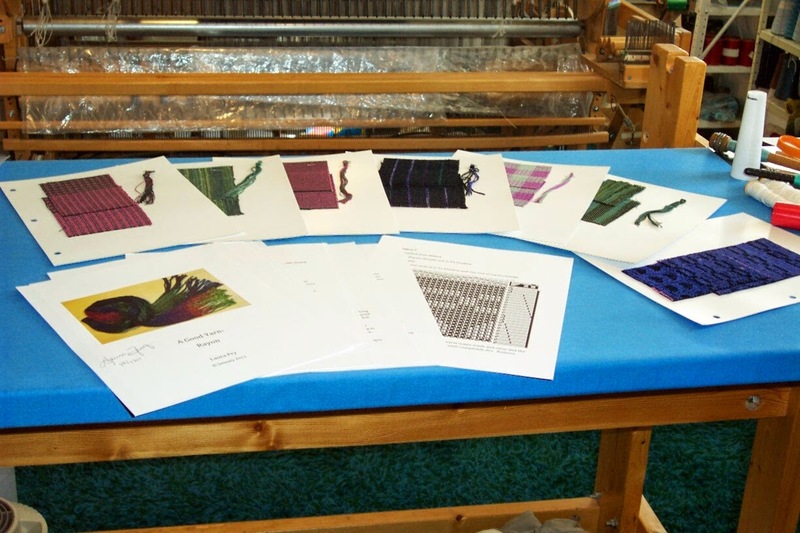 Cotton has 10 projects with before and after wet finished actual fabric samples. Rayon has 7. 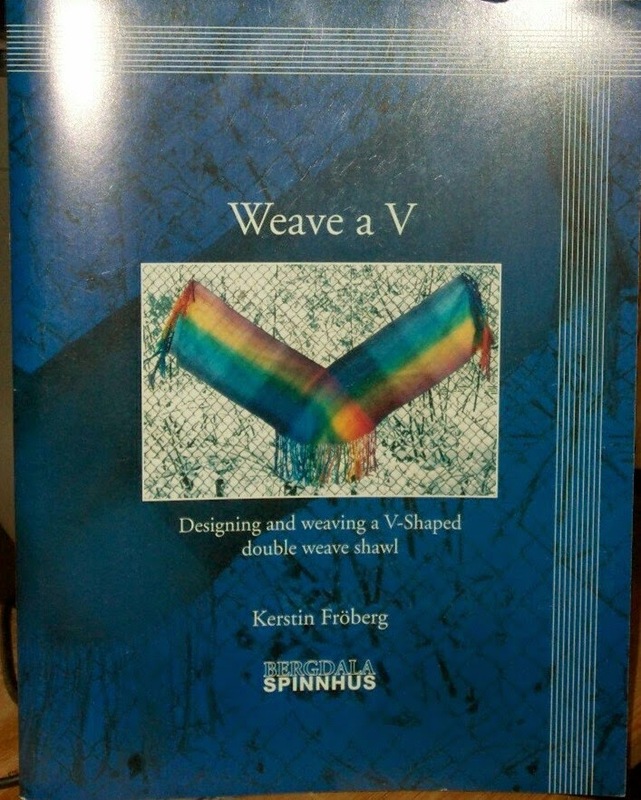 In addition to my own titles I published Kerstin Froberg's Weave A V. This booklet explains how to weave a V shaped shawl using double weave. 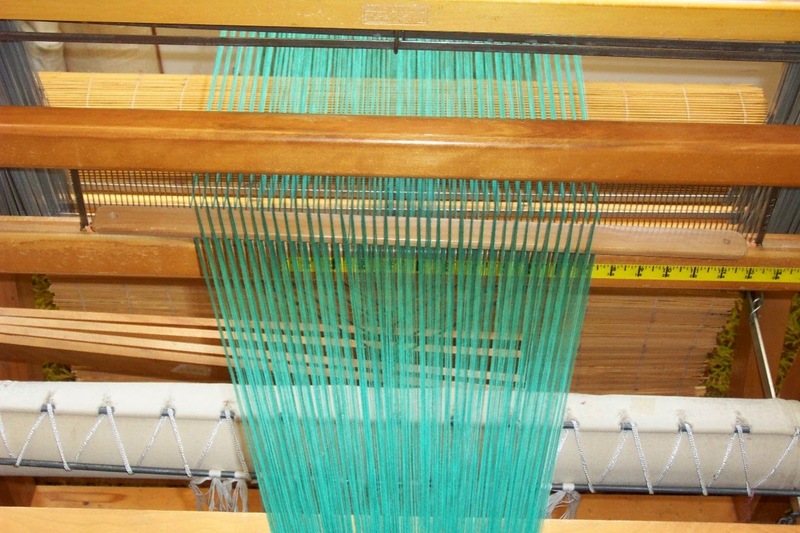 It includes explanations for both rising and sinking shed looms, how to weave four shaft weaves in double weave/width and how to derive the tie up to make sure it works properly when you open the cloth up. The cloth turned out quite nice after wet finishing. They have a nice feel with a little bit of 'scrub' to them. Make good hand or kitchen utility towels. Most of the towels listed on my previous post are still available although some of them are getting low in terms of numbers. Contact me laura at laurafry dot com for details or photos. 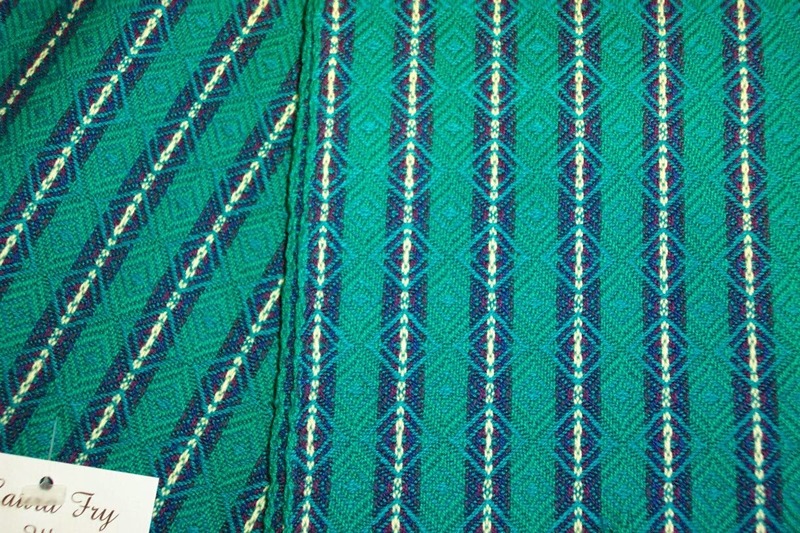 I did not photograph all of the towels I have in inventory (like the turquoise/purple and turquoise/dk blue) ones woven with cottolin weft. Buy two items, get free shipping continues until July 31. The turquoise towels will get wet finished when the temperature is cooler. The next week to 10 days highs will be in the 30's C (90's F) making it much too hot to be pressing. That said, if anyone is interested in either of these warps in terms of my July special offering (buy two items, get free shipping), I will ship when ever they are ready. Price on these will be $28 each. With 11 pounds of singles 10 tow linen to use up, I expect to have to put a third warp on - right now I'm thinking a cream/white warp. In the course of unpacking some of the many many boxes of stuff that was taken to Olds for the vendor booth, I found two more copies of A Good Yarn: Cotton in case anyone was wanting one. All towels are machine wash and dry warm water setting. All are a generous size (although sizes vary depending on style). Any of these towels may be purchased as part of my special July offering of buy two items and get free shipping. Fibre content is listed, then price each towel, then how many are available for purchase. Orders can be placed by contacting me via email laura at laurafry dot com or telephone which is listed on my website on the Contact page. 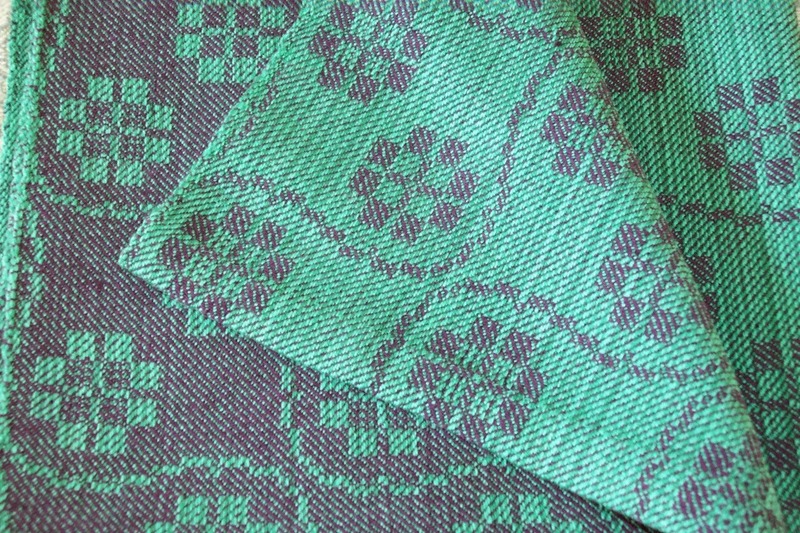 As I finish the turquoise towels I will add them to this offering - the warp may come off the loom today, but if not, for sure tomorrow. 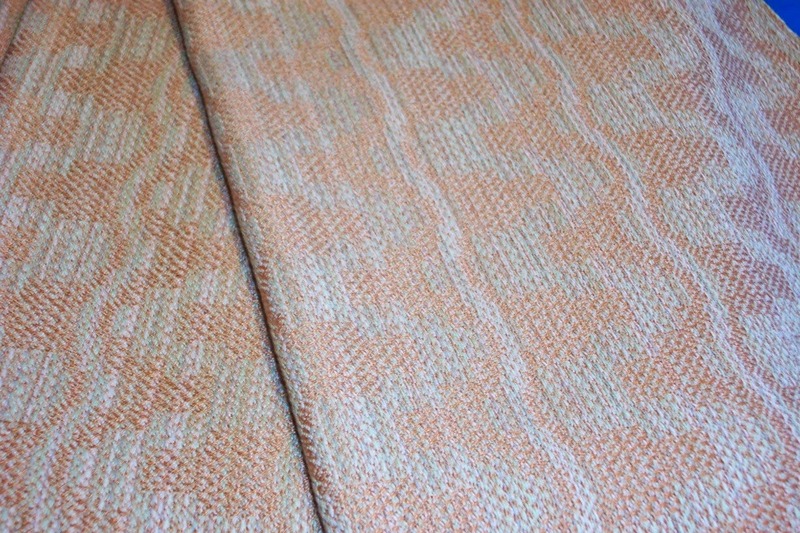 If I can get the next tea towel warp - beige/peach/rust - done by the end of the month they will also be part of this offer. Still loads of A Good Yarn: Rayon, Weave a V and Magic in the Water on cd (one) or flash drive. I will be posting photos of tea towels tomorrow - life got a bit busy/complicated and I didn't have a chance over the weekend. 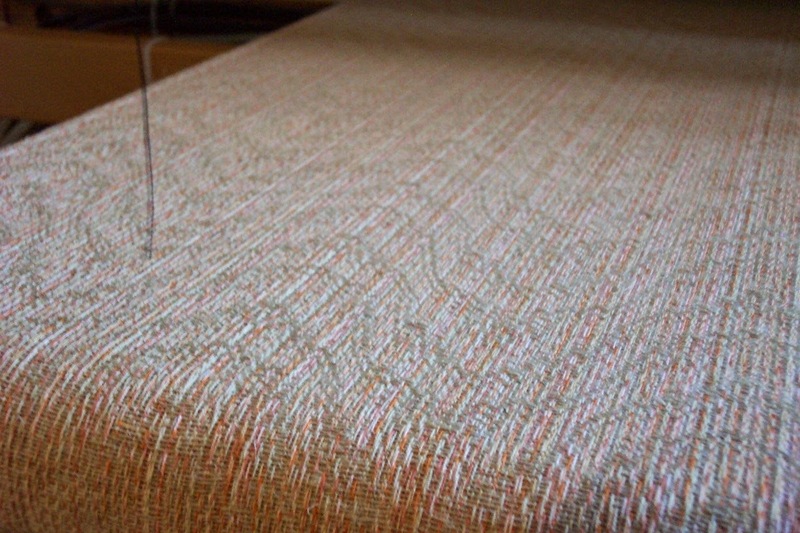 Even though the humidity is 'high' (for us) the singles linen I'm using for weft is wire-y and spring-y and just generally not terribly co-operative. The only solution is to raise the humidity in the yarn itself. 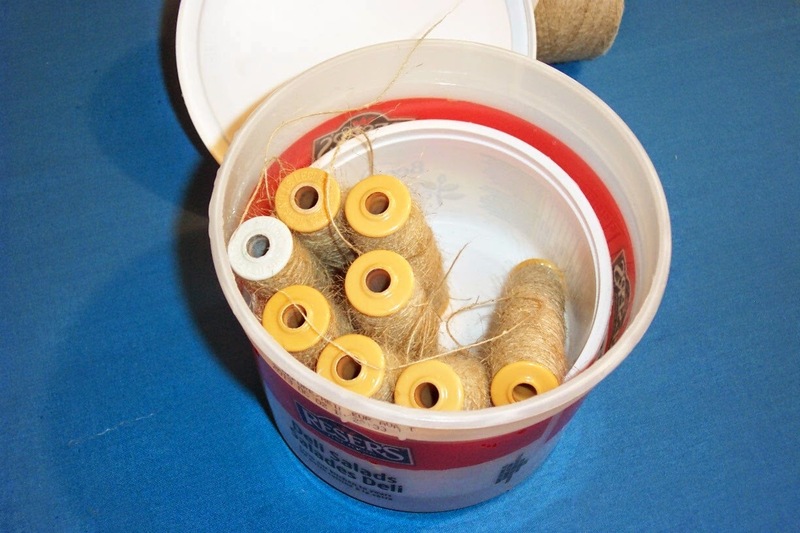 Generally I have always just wound the bobbins and put them in a plastic bag with a damp cloth. This works, but sometimes the bobbins touch the damp cloth and get wet themselves so I've always been very careful to wind just enough bobbins for the daily weaving. However, I have 11 pounds of this stuff - perhaps more in other boxes. With my weaving pace reduced by the beta-blockers I'm not weaving as quickly as I usually do and I was having trouble gauging how many bobbins I could actually weave in a day. Not wanting to risk the linen developing mildew, I thought about what else I could do and came up with this. A tall-ish plastic bucket with a lid, plus a smaller, shorter plastic tub that just fits inside the large one. There is about .25 of an inch all the way round the smaller tub inside the larger one. Draw about 3/4" of an inch of warm water and float the smaller tub inside. Fill the bobbins just level with the flanges. For two reasons. One, I'm using low profile shuttles because the AVL shed is narrow so a fat bobbin will rub against the shed ceiling; and Two, a skinnier bobbin will allow the layers near the core more access to absorbing moisture as the upper layers gather moisture into themselves. Fill the small tub with bobbins and put the lid on (not snapped on, just as a cover) and let 'steep'. 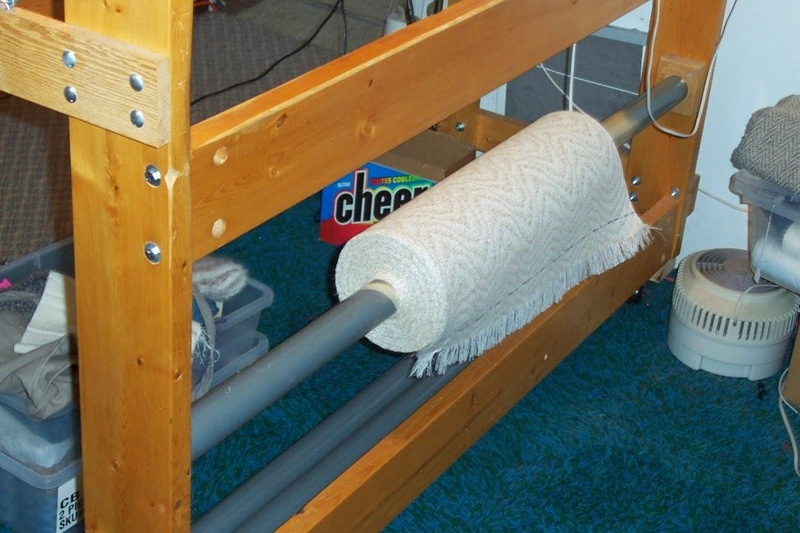 I built two of these, one of which goes by the loom, the other by the bobbin winder. As I empty the bobbins by the loom I take them to the winder and fill them again, storing them in that humidifier until it's full and the loom one is empty and switch them. I don't have any worries about the bobbins getting wet and feel confident that I could actually leave the bobbins in the humidifier for several days with no problems. If I decide it will be too long between winding and using, I will just remove the smaller tub from the bucket until I'm ready to weave again. Then, the night before I will put the bobbins back in to 'steep'. 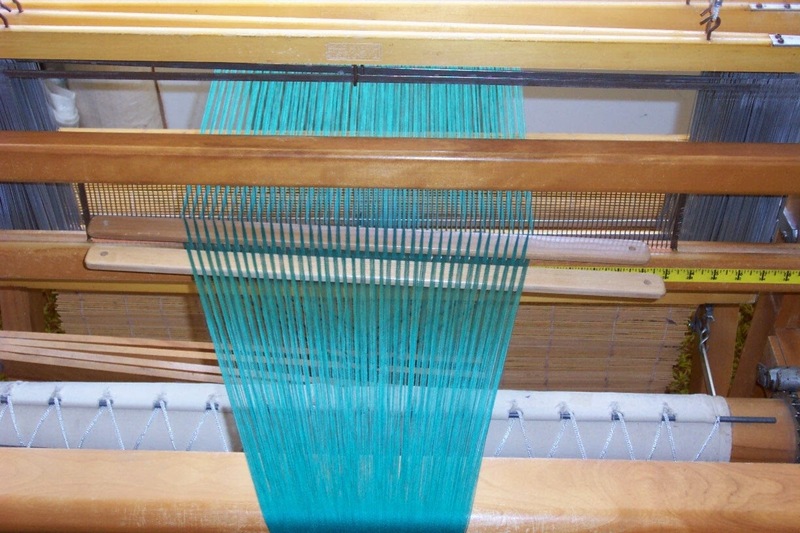 The warp is 2/16 cotton with a tow linen weft. The linen isn't the best quality so there is some chaff in it and they will make great exfoliant towels. :) Once the linen softens up they should be lovely and absorbent although it may take a few uses/launderings before they really develop to their full potential. This is the warp that I thought I had a sleying error in, but when I cut the header off and examined it by holding it up to the window to get the light through it, I can see no problems in that regard so I guess it's fine. If the light through the cloth examination doesn't show a problem, there isn't one to be found! 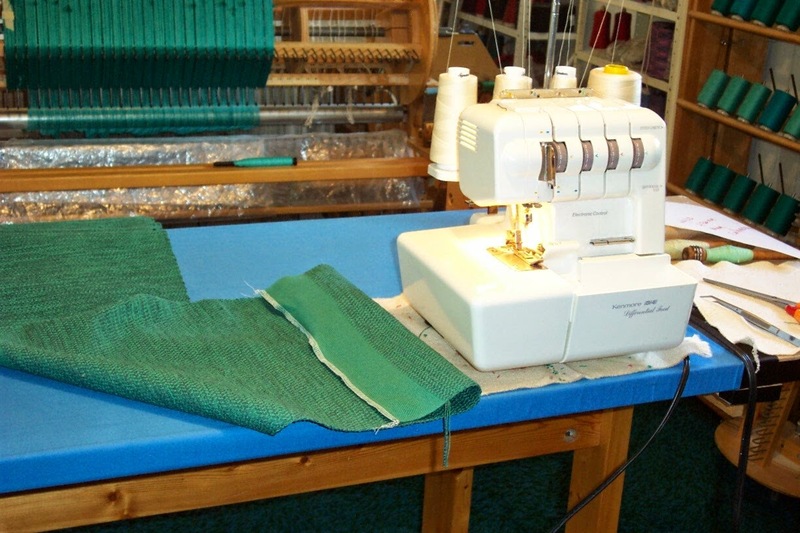 Industry has traditionally used this method during burling and mending to help the inspectors find errors that need to be fixed. 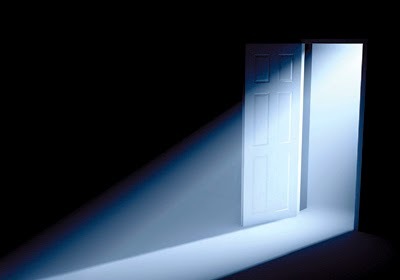 Small items can just be held up to a window (or other light source). For larger items a light table helps to find these problems. Yesterday I said I was going to announce a 'special' on my publications. Traditionally I have done this as a combination Canada Day/July 4/my birthday offering. 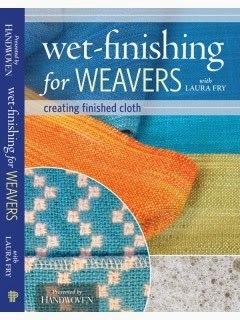 I have produced Magic in the Water; wet finishing handwovens. This is now OOP as a 'real' book, but available on CD (3 copies), on a flash drive or a digital download. A Good Yarn: Cotton (8 copies, I think, 6 for sure) and A Good Yarn: Rayon (way too many copies left - 40?) 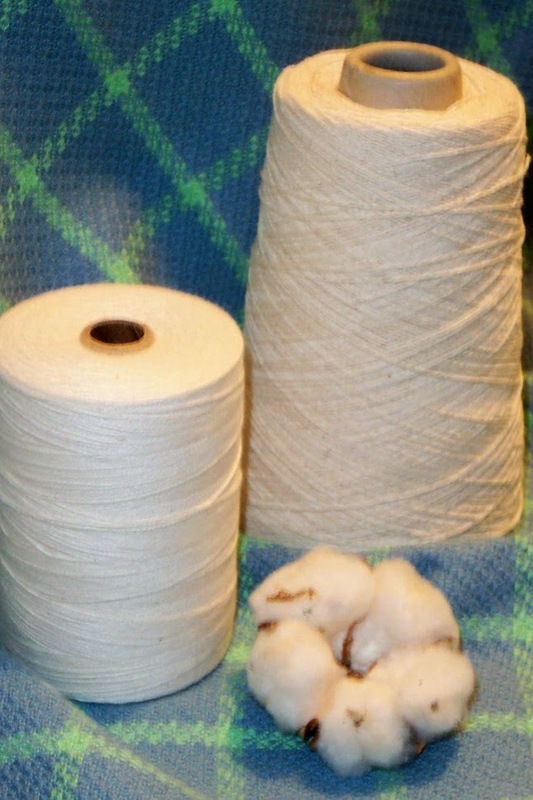 are sample packets with explanations of the fibre characteristics of each yarn. 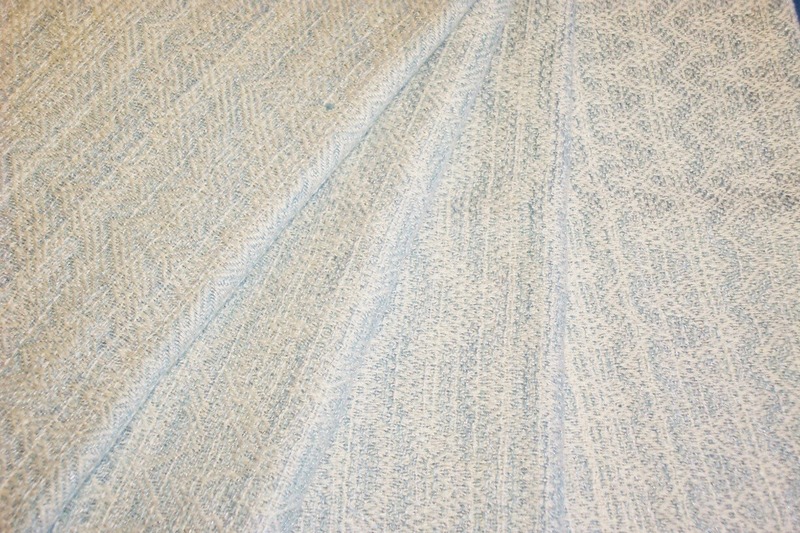 Cotton has 10 projects with before and after wet finished actual fabric samples. Rayon has 7. Normally these prices would all have shipping added. Buy any two items and shipping is free. Tea Towels! Have I got Tea Towels! They range in price from $24-$36 depending on fibre and weave structure. 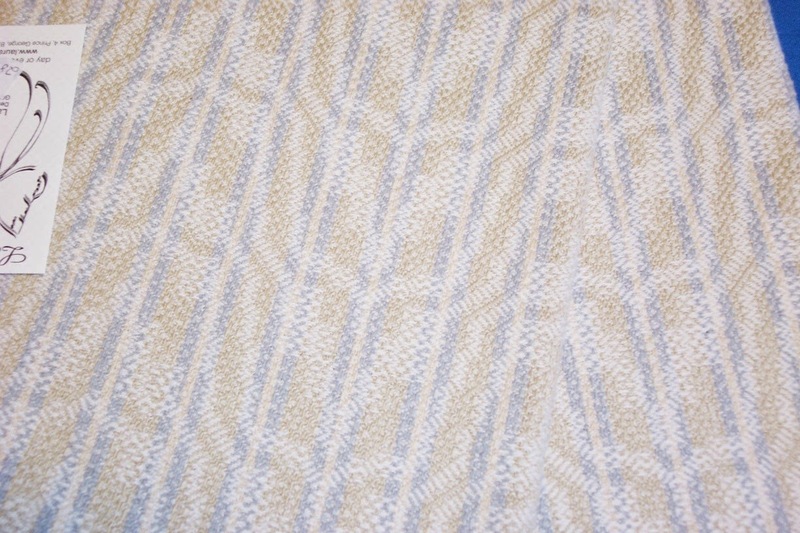 Some are 2/8 cotton warp with cotton slub for weft - great kitchen utility towels. $24 each. 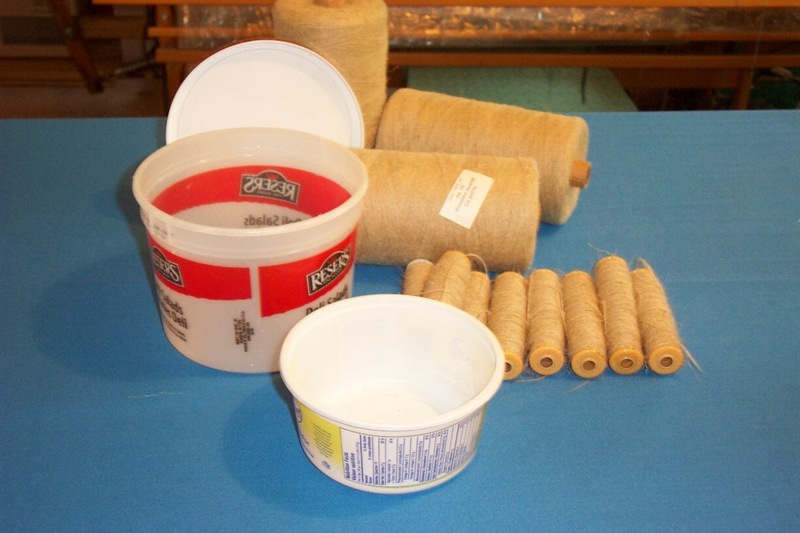 Some have cottolin for weft: $32 each. 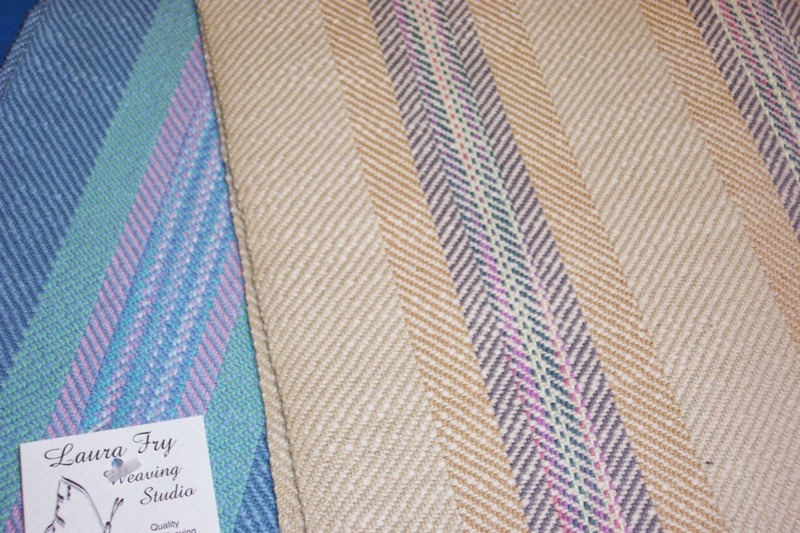 Finer cotton warp (2/16 or 2/20 mostly) with fine linen weft: $36 each. Soooo - buy any two items and get free shipping until the end of July or stock runs out. Further note: If you are across the pond, contact Kerstin directly for Weave a V - although she isn't having a 'sale' you'll get it a lot quicker than coming from me via snail (ground) mail. Once again Life has taught me that you should never get too attached to your plans because when Life Happens, you are not in control anymore. Doesn't matter what plans you may have, other things suddenly need to take priority. I won't go into the details of my health issues except to say that once again I am 'special'. Surgery is required to fix the problem but because the surgeon does not consider me 'critical' the wait time could be significant. Since I don't have any idea of when the surgery will be done and the recovery time is significant (4-5 months if all goes well) I thought long and hard about my plans and teaching bookings. Although I was booked to teach at Complex Weavers I had to cancel at the last possible minute which put the conference organizers in an impossible position. I don't want to do that to any other group so I have outright cancelled all my teaching dates. This should give everyone time to make alternate arrangements in plenty of time. Once the surgery is successfully accomplished I should be good to go again - if the cancer doesn't rear it's head any time soon. Another uncertainty over which I have no control - except to live as healthy a life style as I can manage. Thing is, I love teaching. I love seeing the spark in other people's eyes as they get the concepts. It is this interaction - in person - that I will miss the most. Because I'm not done teaching yet. There is still the internet - this blog, the Craftsy blog, You Tube (if I feel inspired to do more video clips). There is also the possibility of self-publishing, which I set aside but may re-visit in the form of digital downloads, not actual publications. With the increase in shipping costs sales of 'real' paper type publications has fallen off. 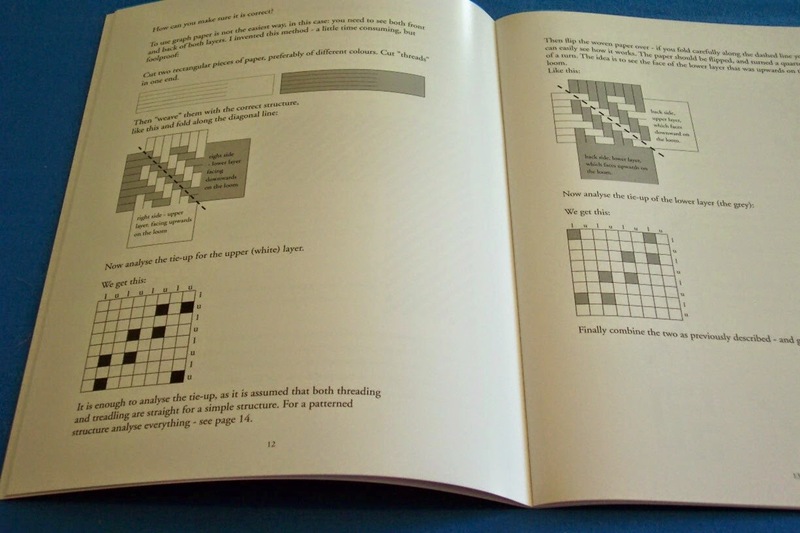 I still have 8 copies of A Good Yarn: Cotton and way too many copies of A Good Yarn: Rayon and Weave a V by Kerstin Froberg left. 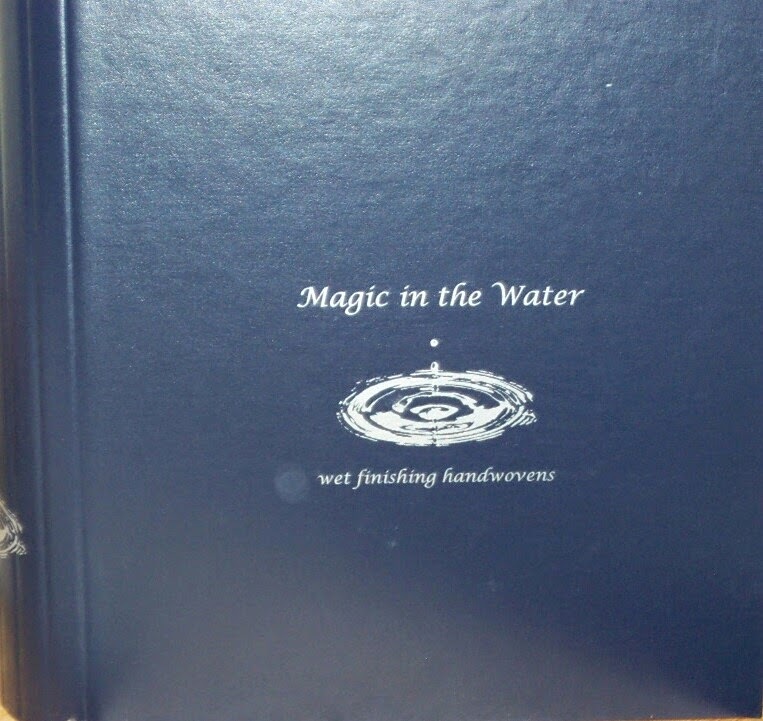 I'd love to see them in new homes so I'm thinking of doing a Special Offer of these and Magic in Water on Cd (three left) or on a flash drive. I will make an announcement about that tomorrow.